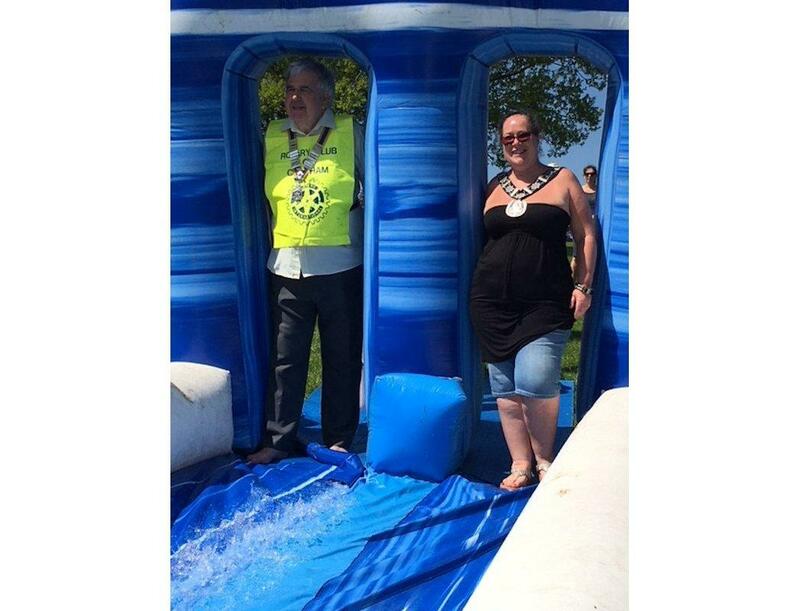 In May this year Chesham Rotary Club supported Mayor Emily Culverhouse in the Mayor’s Charity Water Slide Event held in Lowndes Park. In May this year Chesham Rotary Club supported Mayor Emily Culverhouse in the Mayor’s Charity Water Slide Event held in Lowndes Park. The photo above shows Mayor Emily and Rotary Club President Jon King at the top of the 100 metre slide eagerly waiting there turn to hurtle down through the water. We then see the President just starting on the Slide and he looks as if he will enjoy it, or at least he will when he gets to the bottom. And there he is on his way getting absolutely soaked. Fortunately it was a beautiful day, lovely and warm and a great time was had by all including the President and the Mayor who enjoyed it so much the first time she did it twice. It also raised a lot of money for charity.